Welcome to Connections - an inter-denominational, cross cultural, multi racial and multi faceted Christian ministry with its administration base in Brixton, London. Our aim is to reach the nations for Jesus Christ by serving Christians in the UK and overseas through pioneer evangelism, church planting, training leaders, relief and social programmes. 1. The first is the relational dimension, which serves by helping leaders and churches to reach their full potential in God and to fulfil their vision. God and His kingdom are larger than any of our spheres of influence, and He desires for these spheres to be linked together in a living and dynamic manner to more effectively carry out the Great Commission. 2. The second formerly known as International Connections has a principle objective to raise funds and resources (providing a ministry of helps) to support the work of local churches overseas in reaching their nation with the gospel and caring for the people in their communities. Some of our work is in the area of promoting church unity, including relationships amongst the different races. As evangelicals, we are committed also to the proclamation of the Gospel of the Kingdom, especially amongst those who have not yet heard. · Proclaim the Gospel particularly amongst those who have not yet heard. · Work for reconciliation between different cultures, races and denominations. · Plant and pioneer churches, cross-culturally. · Implement social action programmes relevant to existing needs. · Facilitate and serve the body of Christ, especially its leaders. · Train and equip leaders. · Promote self-help projects in the United Kingdom and overseas. · Caring for Churches – Helping churches to formulate vision, decide direction and implement appropriate structures. · Overseas involvement – Through ICLC (International Christian Leadership Connections) we provide oversight to a large number of churches in many nations, working hand in hand with International Connections to support and initiate self-help projects, e.g. sewing factories, agricultural, wood-working and mechanics workshops. · Networking ministries – A world wide network of relationships committed to the breaking down of barriers between races, cultures and churches, promoting unity and the building up of relationships and churches. · Nationwide links – Bringing Christians together from a variety of different backgrounds and cultures that the world may see we are one in Christ Jesus. · Evangelism – initiating and implementing innovative evangelistic programmes to see the nations won for Christ and the advancement of His Kingdom, primarily at local church level and overseas. · Church planting – Our objective is to see new churches raised. These newly emerging churches need leaders, thus our commitment to raising a new generation of leaders through Training, Intercession, Oversight for Leaders, Non-denominationalism, Social Action. · Training – aimed at equipping today’s church and preparing tomorrow’s leaders. · Intercession – We recognise the need and obligation to pray for each other by responding to the prompting of the Lord by the Holy Spirit to pray for specific needs at different levels. Praying in keeping with God’s heart and mind for all situations. · Oversight for leaders – We have a core apostolic leadership team that inputs into the lives of leaders. Leaders are also encouraged to nurture relationships across the network which will help them grow and develop and provide that much needed sense of belonging. · Non-denominationalism – non-racial/cross cultural. 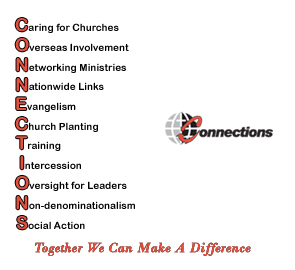 Connections place a primary emphasis on working across denominations and cultures, fostering unity for the advancement of the Kingdom. · Social Action – Identifying and responding to needs within our communities, showing the love and compassion of Christ in a tangible way. We recognize that Social Action is no longer an optional extra but an essential part of the Gospel to demonstrate the Kingdom of God on earth. It is part of the Kingdom Manifesto. Connections is autonomous and exists in its own right, yet is very much committed to the principle of partnership with other Christian bodies so as to avoid duplication of effort. We believe in the validity of shared vision and common values, enabling, developing and facilitating individuals and churches to reach their optimum potential and fulfil their vision. May the Lord bless you and remember… TOGETHER WE CAN MAKE A DIFFERENCE. Connections Trust is a registered charity in England & Wales 1113099 and a registered company limited by guarantee 5698284.